Slendy!!!!!!!!!!!!!!!!!!!!!!!!!!!!!!!!!!!!!!!!!!!!!!!!!!!!!!!!!!!. . Wallpaper and background images in the The Slender Man club tagged: photo. Actually, in Slender: The Arrival it is reveled that Kate could possibly be the one to originally draw the pages. Referring to the level Genesis, if you collect all eight pages, Slenderman will say "I have plans for you Kate." 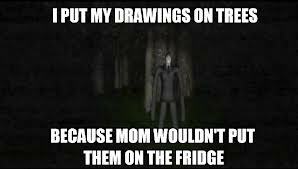 My theory is that Slenderman took a few of her drawings and spread them around the forest, I have no clue why Kate went into the forest, but I assume she was just walking and saw that one of her drawings were there. You should know the rest.